Pappy Neal Was My Father. 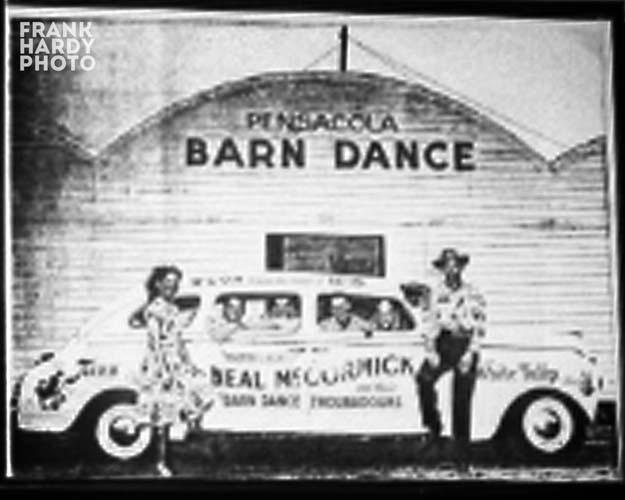 This Is a picture of one of his barn dance halls that he owned and played at in the 40s and 50s. His first “Barn Dance” was in Panama City. You can find a picture of it at the Panama City Library. My Sister had the original of this Picture and put it in his book called “The Man Behind The Scenes” that talks about his life and his time with Hank Sr. If anybody has a Photo during this time of Daddy or Hank I would love to have one. P.S. That is Pappy and his first wife Nancy Jane on the fenders of the car. I am not sure about the guys in the band that are looking out the windows. Thanks for reply. I lived on N, was very young, my aunt and uncle lived on Cypress. I can remember Hank coming up to the house with a driver. He was sitting on the edge of the porch. Aunt Ruby said “where are your boys, Hank? He said hell I don’t know. He had been on a toot.He and my uncle had worked together at the shipyard in Mobile. There is a reply under your Harbor Restaurant that mentions a Greek gentleman that owned it and the Diamond Horseshoe. Hank played there, Cowboy Copas, Hank Snow, and Pappy Neal McCormick.That I can remember.